For Halloween last year, my daughter had trouble deciding what to costume to choose. She was at that age where she still secretly liked princesses, but was afraid that if she dressed up as one, all of her friends at school would think she was a big baby. She had also recently seen the movie The Wizard of Oz and loved the idea of being Dorothy, carrying her faithful little dog Toto along with her in a basket. 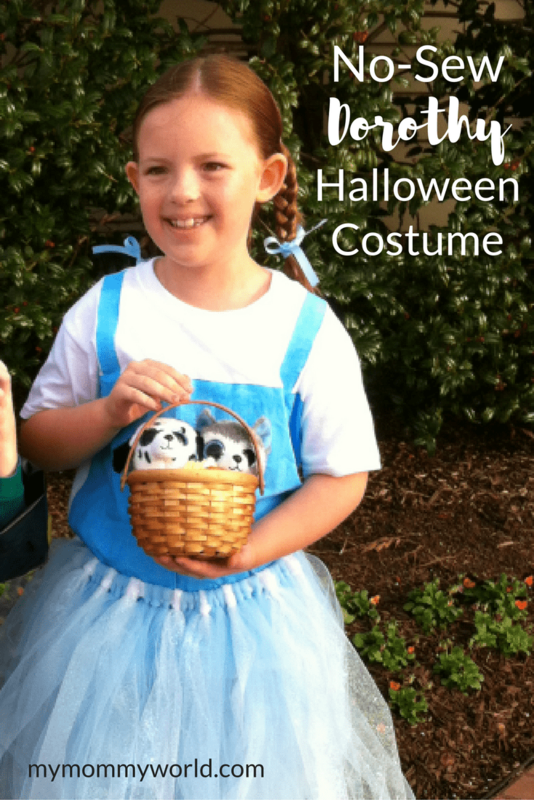 So when I saw this costume idea on Pinterest, I thought to myself, “Why not just make it into Dorothy instead?” So that’s what we did, and the no-sew Dorothy Halloween costume was born! 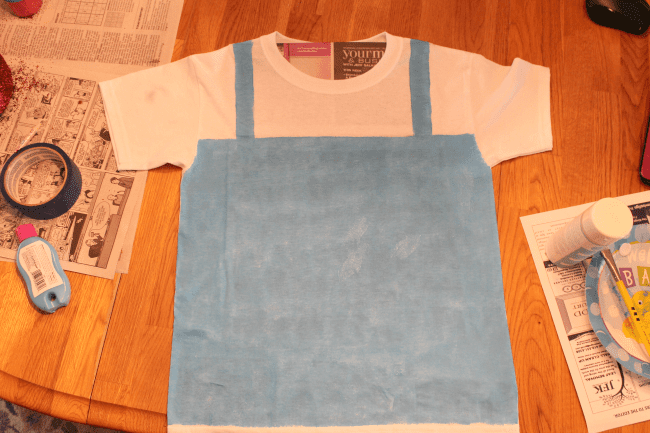 To make the top to the Dorothy outfit, take some newspaper and place it inside the shirt to prevent paint from leaking through to the backside. If you aren’t good at free hand painting, you’ll want to lightly draw on the shape of Dorothy’s dress before you start painting. I didn’t bother with the pencil, and just started painting, making the two straps of the dress and the rest of the blue body. 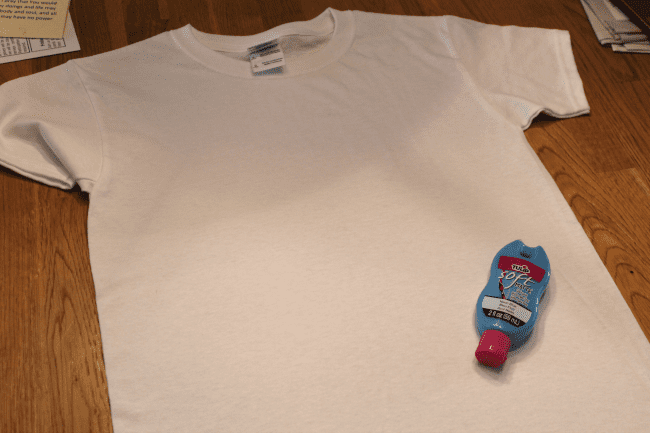 You’ll want to let the shirt dry for at least 24 hours. To create the poofy skirt, begin by measuring your girl. I wanted a longer skirt, so I measured from my daughter’s waist to about the middle of her lower leg. Take whatever measurement you have and double it to determine the length of your tulle strips. (I measured 18 inches for our skirt, so I cut pieces of tulle that were 36 inches long.) Measure your girl’s waist too, and cut the elastic about 1-2 inches shorter to make the waistband of the skirt. Tie your tulle strips around the length of elastic, alternating colors, until you have a full skirt. Use a safety pin to pin the two edges together into a skirt. If you cannot find any ready-made red glitter shoes, you can make your own with red glitter, mod podge, and plain black shoes. Before you start the glitter, make sure you tape off the sole of the shoe (and any other pieces that you don’t want glitter on). This will prevent the glitter from ending up on the bottom of the shoe and being tracked all over the house. Paint the Mod Podge on one section of the shoe at a time. Working in sections help prevent the Mod Podge from drying before you can completely cover the shoe in glitter. Sprinkle the glitter over the shoe with a spoon, making sure to hold the shoe over a bowl to catch any extra glitter. Continue until both shoes are completely covered in glitter, then set to dry overnight. You can spray a sealant over the shoes after the glue has dried, in order to protect the glitter a bit. I would say that our shoes lasted about 2 weeks before the glitter started coming off, even with the sealant, so if you don’t plan on your daughter wearing the shoes after Halloween, you can probably skip the sealant. To finish off the costume, you’ll need a small basket and a little stuffed dog. My daughter couldn’t decide between her doggie Beanie Boos, so she carried both of them with her. We also put some capri-length leggings underneath the skirt, since it is somewhat see-through, and because it is a bit chilly in late October. We also braided my daughter’s hair into the classic Dorothy braids, and tied a matching piece of blue ribbon onto the ends. This unique twist on the classic Dorothy costume really satisfied my daughter’s desire for a pretty, poofy skirt in a non-princess-y way. I hope your girl will enjoy it as much as she did!